Children enrolled in the laboratory preschool, undated. What does it mean to be a child? It’s a simple question that today would garner innumerous answers, all backed by decades of research. But in the early 1900s, children remained for the most part a mystery, at least from the point of view of science. Scientists, who at the turn of the century started making major breakthroughs in fields like adult medicine and psychology, still had little data on how children learn and grow physically, mentally, and socially. Meanwhile, parents’ appetite for evidence-based resources was growing as they grappled with the remnants of World War I and how to best prepare their children for an increasingly urban world. With the child at center stage, the philanthropic and scientific communities came together to build a cast of institutions, including CEHD’s Institute of Child Development (ICD) and its nursery school—now the Shirley G. Moore Laboratory School—with a mission to define childhood, share empirical knowledge with others, and improve child welfare across the nation. was organized at the University of Minnesota in 1925 with the support of the Laura Spelman Rockefeller Memorial, which by the 1920s had focused on child study and parent education as a pillar of its philanthropic strategy. The memorial supported similar institutions at other universities, including the University of Iowa and Columbia University in New York. 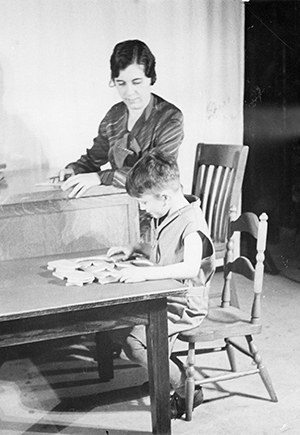 A child participated in a research study at the lab school circa 1930s. From the beginning, the laboratory nursery school was integrated into ICD’s mission of research and training. As one of the first lab schools in the nation, its objectives were threefold: meet the needs of young children and their families, provide a research facility for studying young children, and serve as a training site for undergraduate and graduate students in early childhood education and other fields. In the early years, the lab school was located in the YMCA/Publications Building, later renamed the Music Education Building, in the Knoll area of campus. It enrolled an average of 36 children who were representative of the socio-economic levels of the general population. In 1928, the Institute opened a kindergarten. In both the preschool and kindergarten, children received annual medical, dental, and psychological check-ups, which not only were valuable for families but also provided longitudinal data for researchers. Early curriculum focused on physical growth, hygiene, nutrition, and health habits like sleeping, eating, and toilet training. In addition to providing care and schooling to the children in attendance, researchers also sought to define principles of child development that would lead to a better understanding of children in general. 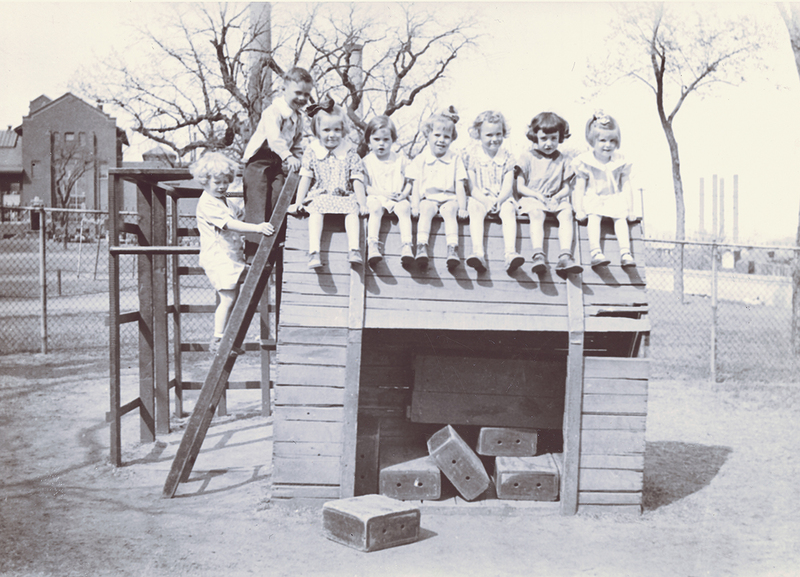 To capture snapshots of childhood from different perspectives, the institute at its founding included experts from eight areas across the University, including anatomy, home economics, education, pediatrics, psychiatry, psychology, sociology, and public health nursing. 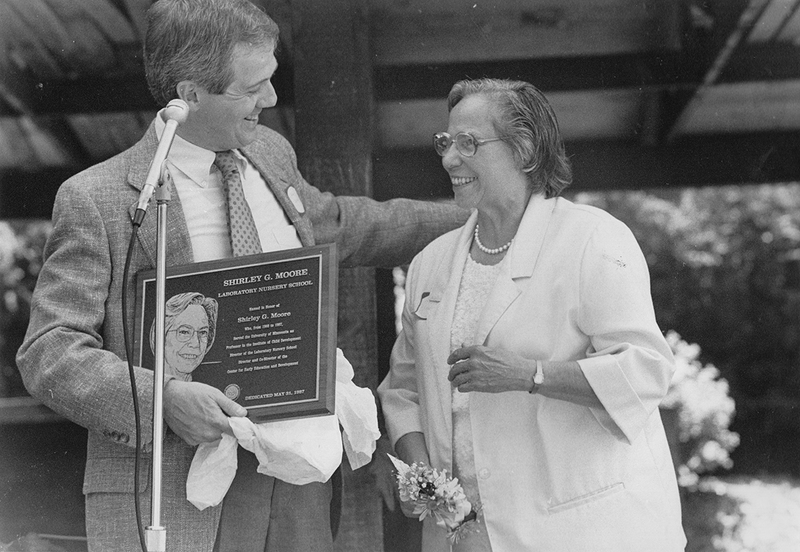 Under its first director, John E. Anderson, more than 100 research projects were developed in the institute’s first year alone, and nearly every researcher conducted studies at the lab school. Study topics included school attendance, illness at various ages, physical growth, behavior, and language and social development. Fulfilling their goal of sharing new child development science with parents, researchers at the institute also produced several best-selling books. Modern Baby Book (1929), by Anderson and associate professor Florence Goodenough, offered parents the opportunity to track their child’s development from birth to adolescence. In the decades that followed, the lab school evolved its approach to better meet the changing needs of the children and families it served. In 1955, the preschool moved to its current location, which at the time was called the Education Building. The building was renamed the Institute of Child Development and Welfare and, two years later, the Institute of Child Development. In 1959, the kindergarten was transferred to the University’s elementary school. Shirley G. Moore, who directed the lab school from 1960 to 1979, updated the preschool curriculum to offer children individualized, developmentally appropriate education based on guided discovery and play. The laboratory school movement of the 1900s included not only preschools but also elementary and high schools. At one time the University had all three. Now bearing Moore’s name, the lab school today annually enrolls more than 100 children ages two to five. Enrollment is open to families throughout the Twin Cities and reflects a diverse community. The school also offers an inclusive environment for children with special learning needs in every classroom. The lab school is one of many throughout the United States that continues to be affiliated with an institution of higher education. Lab schools across the country use a variety of educational models, placing varying emphasis on research and training. Today’s curriculum at the Shirley G. Moore Lab School reflects current best practices in cognitive, social, emotional, and physical development. During the school day, children take part in child- directed and teacher-facilitated learning experiences. Every day offers children a range of learning opportunities, including large and small group activities that focus on math, science, art, literacy, sensing, block building, dramatic play, gym, and outdoor play. Now, more than 90 years after it opened its doors, the lab school remains central to ICD’s mission of research and training. Outfitted with observation booths in each classroom, the lab school continues to be a valuable research site for ICD faculty and graduate students, who conduct studies and test methodologies there each year. For example, two recent studies led by ICD faculty members have focused on how young children learn multiple languages and on executive function, a cognitive process that affects skills like focus and attention to a task, self-regulation, and critical thinking. 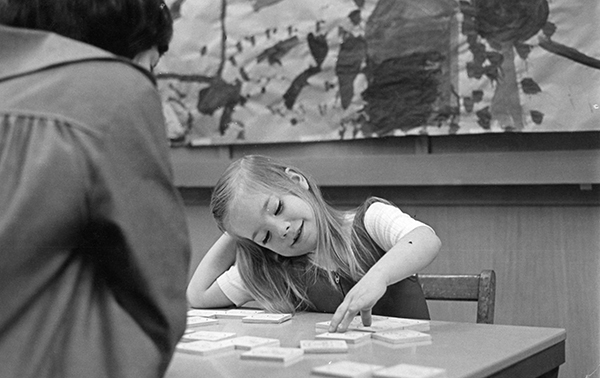 A child plays in a class at the lab school led by teacher Marie Lister. 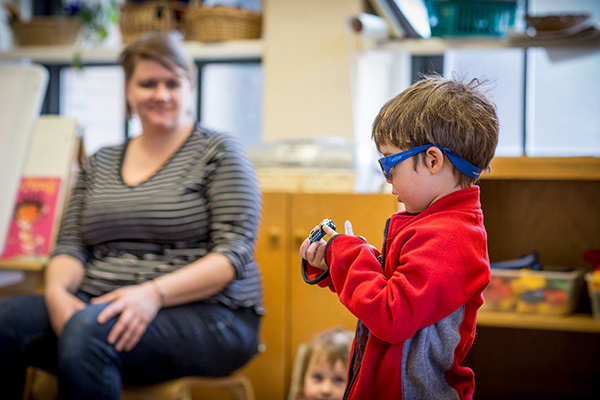 The lab school also helps ICD’s undergraduate child psychology students make connections between what they learn in the classroom and how it applies to life. Another major function of the lab school is training early childhood education teachers. More than 30 undergraduate and graduate teacher candidates work in the school each year. Looking ahead, lab school staff hope to broaden the school’s reach in an effort to share research and best practices with more children, families, students, and teachers. Early childhood and child care are currently at a crossroads, according to Pamela Miller, MEd ’14, also a lead teacher at the lab school. Learn more about the Shirley G. Moore Laboratory School and the Institute of Child Development.